Philadelphia police were expected on Wednesday to take action in a dispute between West Mount Airy residents and the owners of a pair of pit bulls that allegedly have bitten three people and four animals over several years, according to a group of neighbors. At a community meeting held by the residents Tuesday night, police said they would issue a citation for harboring dangerous dogs, according to Michael Kleiner, a spokesman for the group. The meeting was the latest attempt the neighbors took to hold the owners accountable. "I think we're a little more optimistic now," Kleiner said. If declared dangerous by a judge, the dogs would either be euthanized or placed under a set of strict and costly regulations that include a $50,000 liability insurance policy. The dogs would be required to be muzzled and leashed when taken off the owner's property and confined in a proper enclosure. They also would be placed on the state's dangerous dog registry. The pit bulls live on the 100 block of West Sedgwick Street with Ada Brooks. One of the animals belongs to her son, who has since moved out, Brooks said in an interview Monday. The other was bought by her son's friend, but is licensed under her name, she said. When reached Wednesday, Brooks said her neighbors are forcing her into court, but declined further comment. Fourteenth District Police Capt. Sekou Kinenebrew, who met with the residents, was unavailable for comment on Wednesday afternoon. Kleiner said police are able to issue a citation only for the most recent attack, because it falls within a 30-day reporting period. That incident occurred Feb. 11 when the unleashed dogs allegedly bit Pashi Mida after she stepped out her back door. It reignited concerns held by several West Mount Airy residents who feared the next victim could be a child. Kleiner said many residents plan to attend the court hearing, but noted it only will focus on the alleged attack on Mida. "We may not be able to use all the other testimony," Kleiner said, "but our presence will be there and our attendance will help." In an interview Monday, Brooks admitted her dogs have bitten other people and animals, but said her neighbors' claims were exaggerated. She placed the number of incidents at three. That included the incident involving Mida, which Brooks said happened under the watch of her son. Brooks said only one of the dogs is aggressive and that she has kept it muzzled when off her property since the latest incident. 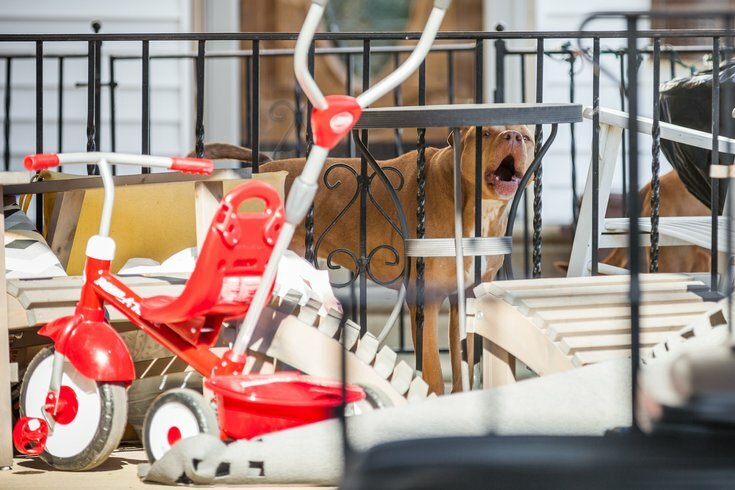 To be declared dangerous, a judge must determine that an unprovoked dog has attacked, inflicted severe injury or killed a human or domestic animal while off its owner's property, according to Pennsylvania's dog law. But the "dangerous dog" designation has not been applied to Philadelphia dogs as frequently as it has elsewhere in Pennsylvania. And the West Mount Airy residents claim they received little assistance from police for years, despite filing several police reports. Animal Care and Control Team, a nonprofit agency contracted by the city of Philadelphia, is responsible for ensuring owners of the city's 12 dangerous dogs adhere to the requirements for owning such animals.